An open prison which has had dozens of prisoners abscond this year has been described as "safe and stable" in a new report. 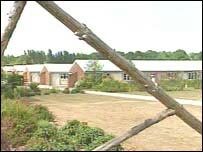 Sudbury Open Prison in Derbyshire has had more than 40 prisoners abscond so far this year. The Prison Inspectorate report said inmates should be allowed to watch TV and play video games in their rooms. Governor Chris Davidson said inmates are kept there on trust without "fences or walls like... in other prisons." "This has been an open and resettlement prison since 1948 - there has always been absconds and I am sure there always will be. "When people are here on trust sometimes they will break that trust," he said. He said video games would be allowed but the privileges would be withdrawn if necessary. The inspection by the HM Inspectorate of Prisons took place in early May. HM Chief Inspector of Prisons Anne Owers said the spot inspection showed Sudbury prison was "a basically safe, stable and purposeful environment". The report said: "Some of the systems to support prisoners on and after arrival had been strengthened, though arrangements to detect and deal with bullying needs further development." It added that healthcare was a particular concern, with unsafe clinical recording practices, poor appointment practices, and insufficient mental health support. "Substance use work needs more development, especially if the new integrated drug treatment system is to be introduced," the report said. A total of 76 prisoners absconded in 2005 and more than 660 in the past 10 years, according to figures from the government.